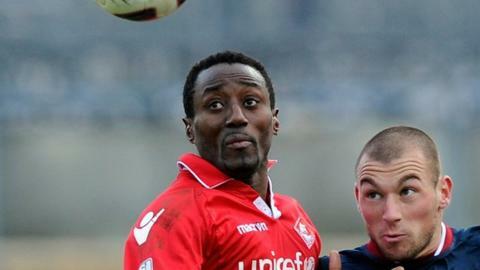 Veteran international Kewullay Conteh has been named as the Sierra Leonean who has been handed a worldwide ban for his role in match-fixing in Italy. On Wednesday, Fifa confirmed the global extension of sanctions imposed on 70 players caught up in the scandal. "We are shocked and disappointed," Sierra Leone FA secretary general Abdul Rahman Swarray told BBC Sport. A Cameroonian player has also been caught up in the affair but his identity is yet to be known. Conteh, 35, has been handed a 20-month ban, which started last June and is set to end in January 2014. "I'm surprised and I'm not happy about the decision to ban my brother because we believe he's a decent and honest guy," Kewullay's elder brother Baimba Conteh told BBC Sport. "I pray that he overcomes it and returns to the game as a stronger footballer." Along with some of his team-mates, the defender has been accused of agreeing to fix a number of games in Serie B, the second division of the Italian league, while with Albino Leffe between 2007 and 2009. He was among 70 players and officials that were found guilty after being investigated by the Federazione Italiana Giuoco Calcio (FIGC). After being officially informed of the disciplinary action by the FIGC, Fifa has now extended the sanctions of the players worldwide - notifying the Sierra Leone FA (SLFA) on Wednesday. "We are shocked because we know Conteh to be an obedient player," added Swarray. "We hope he'll recover from this and bounce back." Conteh has made many appearances for Sierra Leone but last played for the Leone Stars against Niger in March 2011 - when contesting a 2012 Africa Cup of Nations qualifier in Niamey. He was also part of the last Sierra Leone side to play at a Nations Cup - playing every minute of the Leone Stars' campaign in South Africa in 1996. The Fifa ban could spell the end of the road for the former Ports Authority and Real Republicans star, who became the first Sierra Leonean to play in the Italian league in 1996 while with Atalanta. Conteh also played for several other Italian clubs, such as Chievo Verona, Venezia, Palermo, Grosseto and Piacenza, with a brief spell with Café Opera in Sweden as well.